Beautiful certificate from the Elmira and Williamsport Railroad Company issued in 1963 or earlier. 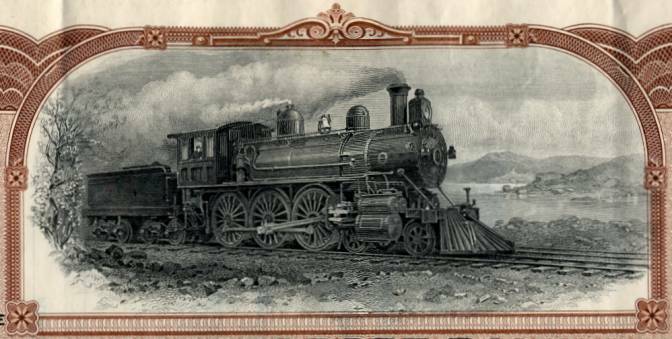 This historic document was printed by the American Bank Note Company and has an ornate border around it with a vignette of a steam locomotive. This item has the original signatures of the Company’s President, and Assistant Treasurer, and is over 50 years old. The Elmira and Williamsport Railroad Company is a corporation of the State of Pennsylvania, having its principal office at Philadelphia, Pa. The records reviewed do not indicate that the Elmira and Williamsport is controlled by any individual or corporation, nor, that it controls any common-carrier corporations. The property of the Elmira and Williamsport has been operated during its corporate life as indicated below. On January 1, 1918, the common-carrier property of the Elmira and Williamsport was taken over for operation by the United States Railroad Administration as a part of the operating system of the Pennsylvania Railroad and it is so operated on the date of valuation. 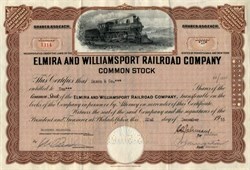 The Elmira and Williamsport was incorporated March 12, 1860, under special act of the State of Pennsylvania, and by articles of association dated April 17, 1860, for the purpose of acquiring the property, rights and franchises of the Williamsport and Elmira Rail-Road Company, which was done. The latter company was incorporated June 9. 1832, under special act of the State of Pennsylvania. Under special act of the State of New York, April 9, 1850, it was granted authority to extend its road from the Pennsylvania-New York State line to Elmira, New York. The property, rights and franchises of the Williamsport and Elmira Rail-Road Company were, under the special act of the State of Pensylvania, April 5, 1849, sold at foreclosure on October 1, 1849, and were conveyed by deed of a sequestrator, dated October 6, 1849, to William Chester, et al. Under special act of the State of Pennsylvania, March 11, 1851, the purchasers became stockholders of the corporation, and, by deed dated March 12, 1853, they reconveyed the property to the Williamsport and Elmira Rail-Road Company. The property, rights and franchises of the company were again sold at foreclosure on April 18, 1860, after receivership begun about September 22, 1859, to interests which conveyed the property to the Elmira and Williamsport by deed dated May 11, 1860. The date of organization of the Elmira and Williamsport was April 17, 1860. The property of the Elmira and Williamsport was solely operated by the Pennsylvania Railroad under lease, from January 1, 1911, to December 31, 1917. From January 1, 1918, to date of valuation the property has been operated by the United States Railroad Administration as a part of the operating system of the Pennsylvania Railroad. Details with respect to the operation of this property rae given in the chapter on leased railway property in the report on the Pennsylvania Railroad.